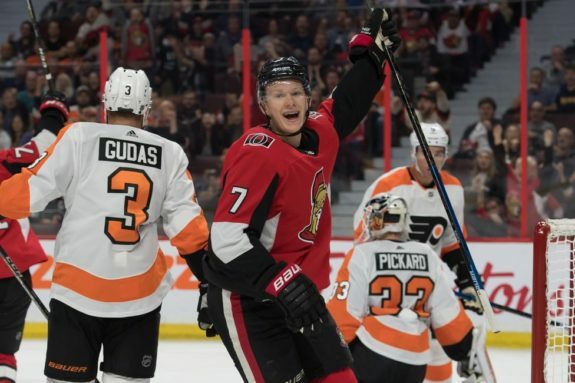 The recent 5-4 defeat against the Carolina Hurricanes marked the eighth straight loss for the Ottawa Senators, putting them last in the NHL with 35 points (from ‘GARRIOCH GAME REPORT: Senators’ eighth straight loss stings – Ottawa Sun – 1/6/19). Over those eight losses, they’ve been outscored 37-20 and allowing five goals to a Hurricanes team struggling to find the back of the net seemed to be the cherry on top. The Hurricanes rank third-worst this season with 67 goals scored, despite having the second-best Corsi for percentage (CF%) of 55.64, giving them the worst shooting percentage at 7.1. With a high Corsi for percentage, it was expected that the Hurricanes would eventually find their scoring touch, and I guess all it took was to play, statistically speaking, one of the worst defensive teams in the league in the Senators. We’re now at the halfway mark of the season with all teams having played between 40 and 45 games. For some teams, it’s evident they’re trending in the right or wrong direction. For others, it isn’t so obvious. That being said, it’s clear the season doesn’t look good in Canada’s capital. Below are a couple of points to note as the Senators finished playing game number 43 — some positives, but perhaps more negatives. 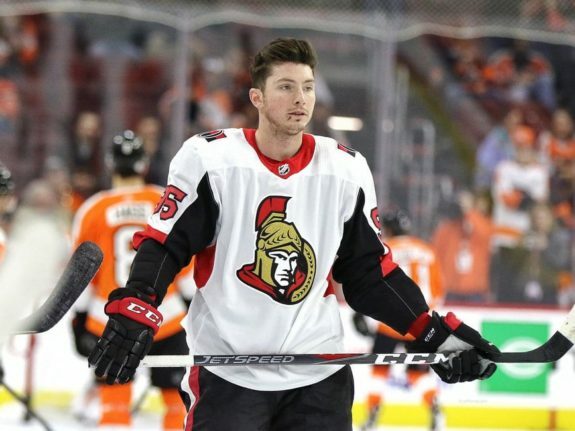 Let’s start with the positive: Mark Stone and Matt Duchene are both in the last year of their contracts, earning $7.35 million and $6 million, respectively. Both will make a lot more next season, and deservedly so. Beginning with Stone, I’m not sure people realize the impact he has at both ends of the ice. Since it’s the Senators, you have to look at the relative metrics for both Corsi and Fenwick, and Stone is leading the NHL in both percentages for any skater with over 200 Corsi or 100 Fenwick chances. Meaning, when Stone’s off the ice, the Senators’ ability to generate scoring chances drops immensely. In addition to Stone’s 47 points in 43 games, he’s also in the conversation for the Selke Trophy, if not the front-runner. He leads the league with 70 takeaways, an unbelievable amount for a winger and 12 more than the Florida Panthers’ Aleksander Barkov in second. 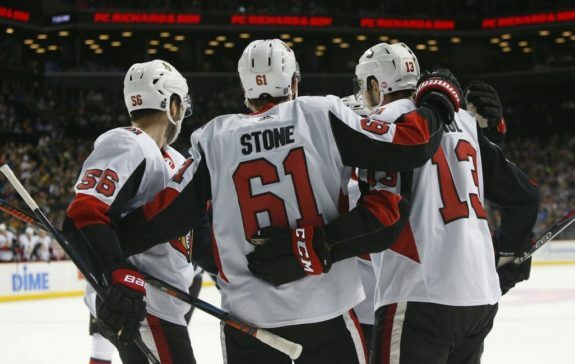 If Stone was on a better team, I think he would be a top-10 player in the league. His sidekick, Duchene, is also having a productive season. He’s scored 18 goals in 37 games while shooting 20 percent, which is fifth in the NHL for skaters with 90-plus shots. The Senators’ shooting percentage when Duchene is on the ice is 14.1 percent, which is fairly high for a last-place team. In terms of value per dollar, he’s fifth in points-per-game for all skaters making $6 million or less, excluding players on entry-level contracts. Of the top-five, some could argue he’s better than the Panthers’ Jonathan Huberdeau and the Columbus Blue Jackets’ Artemi Panarin, who rank third and fourth, respectively, and are having great seasons. Was trading for Duchene the right move? I’m not sure, but the Senators have an outstanding $6 million player. The Senators’ situation is difficult, but I think it’s more about how good the NHL is right now. Looking at the points above, it’s not often that the worst team in the league has All-Star offensive talent, a projected Selke winner and an All-Star defenseman like Thomas Chabot. Now the negative. With Chabot injured, players who are not top-four NHL defensemen are playing top-four minutes. The Senators’ top-two defense pairings have a combined Wins Above Replacement (WAR) of 0.8 with Cody Ceci playing 22:59 minutes a night and a WAR of minus-0.9, which is the worst on the team and sixth-worst in the NHL among all skaters. To put that in perspective, the Toronto Maple Leafs’ back end was a ‘question mark’ heading into the season, but they now have their top-two defense pairings producing a combined WAR of 5.6. The Senators have the worst Corsi for and Fenwick for percentages in the NHL at 43.86 percent and 44.07 percent, respectively. They’ve also given up the most shots with 1,597 and goals at 172. Goaltending is an issue, but three of those four statistics have nothing to do with who’s in net. Ending on a positive note, when you have two rookies on the top line, they’re either good, getting better or hopefully both. With Brady Tkachuk and Colin White, you have both. They are second and third in rookie scoring and White would be fighting for the rookie scoring title in most seasons. Not that plus/minus means much these days, but Tkachuk is even, which, for a rookie on the Senators, isn’t bad. Maxime Lajoie, at 21 years of age, has shown signs of being a great puck-moving defenseman and, without being biased, Chabot is playing like one of the best defensemen in the league with two years left on his entry-level deal. Finally, Drake Batherson came in for 17 games, becoming the first 2017 third or fourth-round draft pick to play an NHL game. He demonstrated his exceptional hockey IQ and developed instant chemistry with Duchene. With the San Jose Sharks leading the NHL in Corsi for percentage, Fenwick for percentage and shots for percentage, it’s no surprise they’re comfortably sitting in a playoff spot. 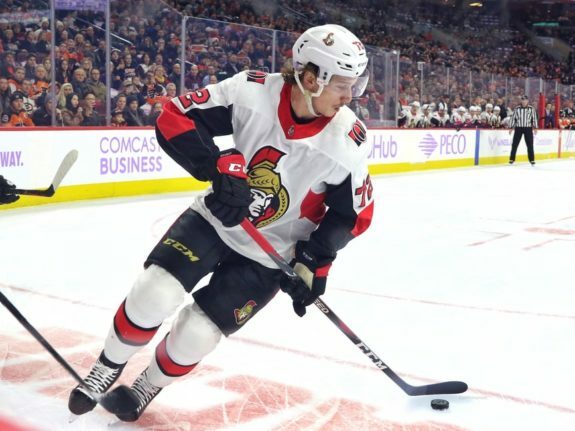 Because of that, it’s looking like the Senators won’t have a first-round pick in this summer’s entry draft due to a conditional draft pick involved in the Erik Karlsson trade. If the Sharks makes the playoffs, Ottawa receives their 2020 first-round pick. If they don’t reach the postseason, the Senators get the first-round pick this summer. If it wasn’t obvious enough, it’s time to hit the rebuild button. Good news, they have until Feb. 25th to receive any sort of value in Stone or Duchene, who appear to be on their way out this offseason. The window’s also open with only 12 players under contract for next season. The Senators have proven they can score, being in the top-10 in goals, goals in high danger areas and shooting percentage. It’s just too bad there’s more to the game of hockey. General manager Pierre Dorion certainly has decisions to make with regards to goaltending and defence, but this needs to be an entire overhaul over the next few years. For now, enjoy watching the only team in the league with two rookies on the top line and perhaps the last few months we have with Stone and Duchene.